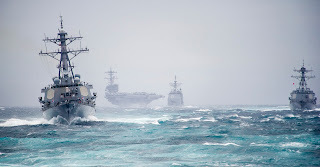 A carrier strike group (CSG) is an operational formation of the United States Navy. It is composed of roughly 7,500 personnel, a nuclear-powered super-carrier (Nimitz class), which is the centerpiece of the strike group and also serves as the flagship for the CSG Commander and respective staff, at least one cruiser (Ticonderoga class), a destroyer squadron of at least two-three destroyers (Arleigh Burke class) and/or two-three frigates (currently the U.S. Navy does not operate any frigates, thus more destroyers in the group), a carrier air wing of about 70 aircraft (typically up to nine squadrons) and up to two nuclear-powered attack submarines (Los Angeles class, Virginia class), used to screen the strike group against hostile surface ships and submarines, but which also carry cruise missiles for long-range strike capability. A carrier strike group also, on occasion, includes attached logistics ships and a supply ship. CSGs are not restricted to a specific composition and can be modified depending on expected threats, roles, or missions expected during a deployment, and one may be different from another. 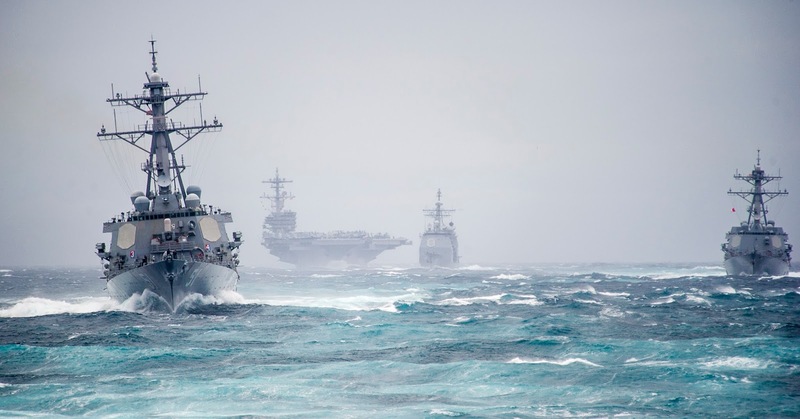 The Navy states that "there really is no real definition of a strike group. Strike groups are formed and disestablished on an as needed basis, and one may be different from another. However, they all are comprised of similar types of ships." 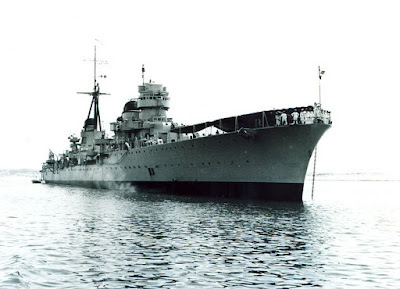 In 1947, Greece accepted from Italy the cruiser Eugenio di Savoia, a Condottieri class light cruiser of the Italian Navy (Regia Marina, the Navy of the Kingdom of Italy) as a World War II reparation for Greece. The new warship renamed Elli, to honor the Elli light cruiser that was sunk by the Italian submarine Delfino while the cruiser sat at anchor near the Greek island Tinos, before the outbreak of the Greco-Italian War on 15 August 1940. The ship was commissioned into the Royal Hellenic Navy (Βασιλικό Πολεμικό Ναυτικό) in 1951 and had a very short career. The 186-meter cruiser was the longest warship ever served with the Hellenic Navy and the largest surface combatant after WWII. However, the largest ever Greek warships were the two per-dreadnought battleships of the Mississippi class, Kilkis and Limnos, that had a full displacement approximately 14,500tons at full load. It should be mentioned that today's Hellenic Navy largest warship is the logistic support ship Prometheus that has a displacement of about 14,000tons and length of 146 meters.